A year ago, Teamsters Local 707 retirees suffered a fate that could soon hit hundreds of thousands of union workers: Their pension fund crashed. Over the past 12 months, the roughly 4,000 retired short-haul truckers who paid into Local 707’s pension fund for the entirety of their careers have had to survive off monthly checks slashed to a third of their former value. “It’s been incredibly hard. Some of our members have lost their homes,” said retiree Edward Hernandez, 67, whose check went from $2,422 to $721 — before city and state taxes. But recently Hernandez got news that gave him some hope. A bipartisan group of lawmakers is pushing legislation to save union pension funds, including that of Local 707. Introduced by Sen. Sherrod Brown (D-Ohio) and U.S. Rep. Richard Neal (D-Mass.) on Nov. 16, the Butch Lewis Act would fix the country’s growing pension crisis by peeling off payments to existing retirees and shoring them up with loans financed by U.S. Treasury Bonds. And the legislation is backed by two of the most senior politicians in Congress: Sen. Chuck Schumer (D-N.Y.) and Rep. Pete King (R- L.I.). “Workers and their families who rely on these plans could lose or see a reduction in benefits earned over a lifetime of work, through no fault of their own,” Schumer said at a recent press conference outside the local’s Long Island headquarters. “The result is that pensions ... would be cut down to the bone — putting their families’ financial security and future at risk,” he said. The Butch Lewis Act would establish a new agency, the Pension Rehabilitation Administration, within the U.S. Treasury Department. The agency would be authorized to issue bonds in order to finance low-interest loans to pension plans in financial distress. Plans like Local 707, which have already bottomed out, could apply to be made whole. 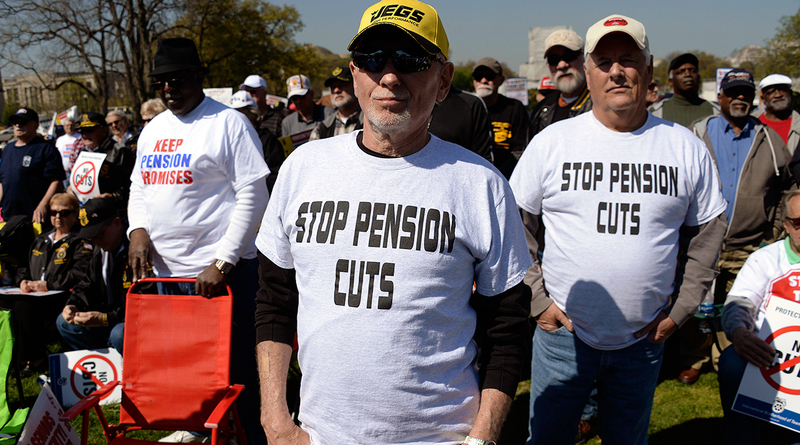 Others, like the Central States Pension that covers 407,000 union workers in the Midwest, would be available to avoid a financial crash, said Bob Amsden, a retired teamster who has been pushing Congress for a solution to the looming crisis. Multi-employer pension plans like Local 707 and Central States were lucrative for decades — before deregulation and Wall Street fluctuations brought the industrywide plans to the brink of disaster. The New York State Teamster Conference Pension and Retirement Fund, which has more than 34,000 participants, is also in danger of not meeting their full obligations to retirees, Schumer said. King also called on Congress to move on Butch Lewis.